The Process Explorer display consists of two sub-windows. The top always shows a list of the currently active processes, including the names of their owning accounts, whereas the information displayed in the bottom window, which you can close, depends on the mode that Process Explorer is in: if it is in handle mode you will see the handles that the process selected in the top window has opened; if Process Explorer is in DLL mode you will see the DLLs and memory-mapped files that the process has loaded. 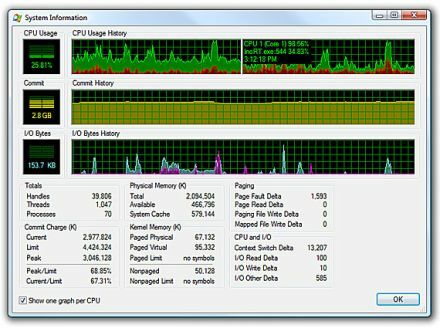 Process Explorer also has a powerful search capability that will quickly show you which processes have particular handles opened or DLLs loaded. The unique capabilities of Process Explorer make it useful for tracking down DLL-version problems or handle leaks, and provide insight into the way Windows and applications work. This Process Explorer release includes several significant new features, including the showing the web hosted in IE8 processes in the process tooltip, display of a svchostâ€™s service host category in its tooltip, mapping of service names to threads on the threads tab and TCP/IP tabs of the process properties dialog on Windows Vista and higher (thanks to Windows Internals 5th Ed. coauthor Alex Ionescu), a new.NET assembly information tab in the process properties dialog (thanks to Pete Sheill), as well as other improvements and bug fixes.